At the Art Show this November, a fellow walks into our tent and he looks familiar. 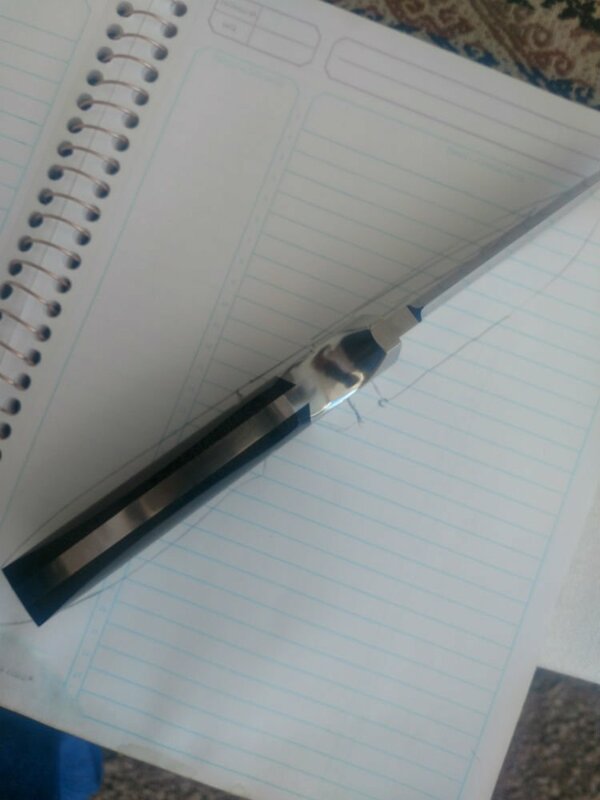 Turns out, he purchased a knife from me probably 8 (?) years ago and he was wondering if I could make a couple more. Not one to refuse an existing customer, I agreed, but there was one small problem. 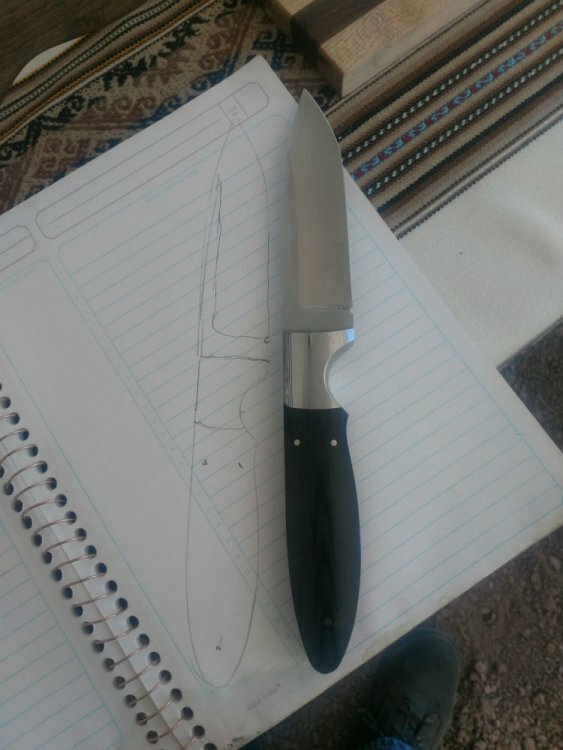 I had lost all the photos I had of that knife and I never made a template of it either. No problem he says and he came back in a couple of days with the knife (he takes very good care of it I might add) and I photographed it and made a full scale line drawing. So this was back in the days when I didn't taper the tangs on my full tang knives and I used dovetailed bolsters as well. This one is 5160 blade steel, which I don't use anymore, 416 stainless bolsters and black linen micarta scales. The spine of the finished knife is just under 1/4"
I explained that I now do the tapered tangs and use O-1 steel and he said he wanted some desert ironwood scales. Everyone is happy, so here we go. 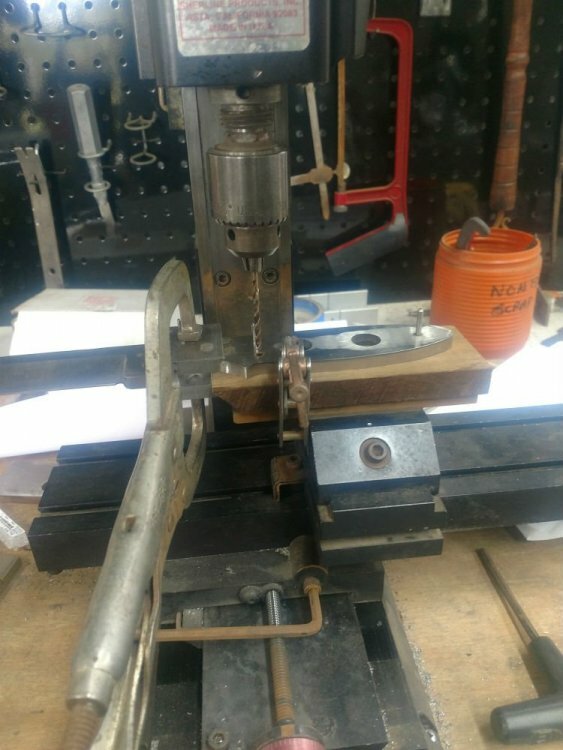 I have a bunch of O-1 drill rod, 1" diameter That I could forge down, but I also had a piece of 1/4" by 2" bar stock. 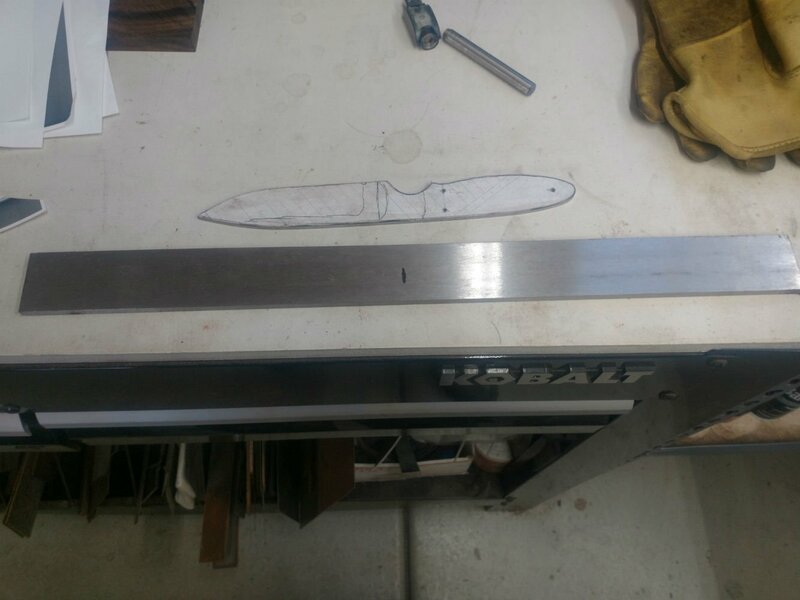 I really need to get fatter than 1/4" for these knives, if they are going to finish out as thick as the original, so I have to forge this bar down to 1.125" by .30". So, that's what I did. The starting bar and the template I made from the photos and sketch. 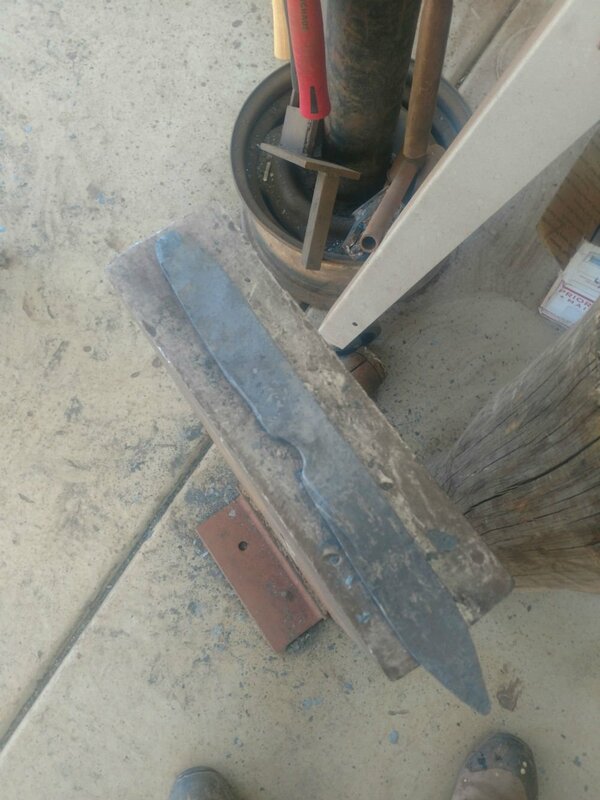 After forging the bar and cutting it in half, I forged the pointy ends. Then I shaped the handle and started the finger slot. 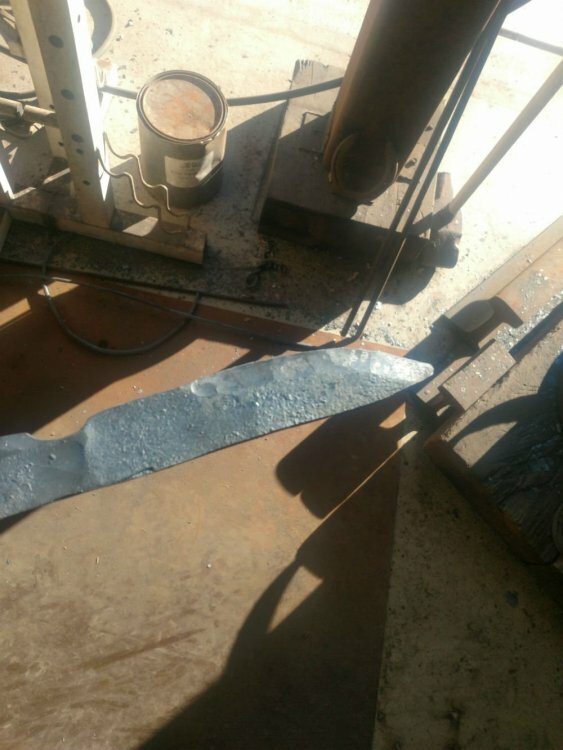 Now to forge in the bevels and widen the blade. These will be hollow ground, so I cannot get too wild with the bevels. 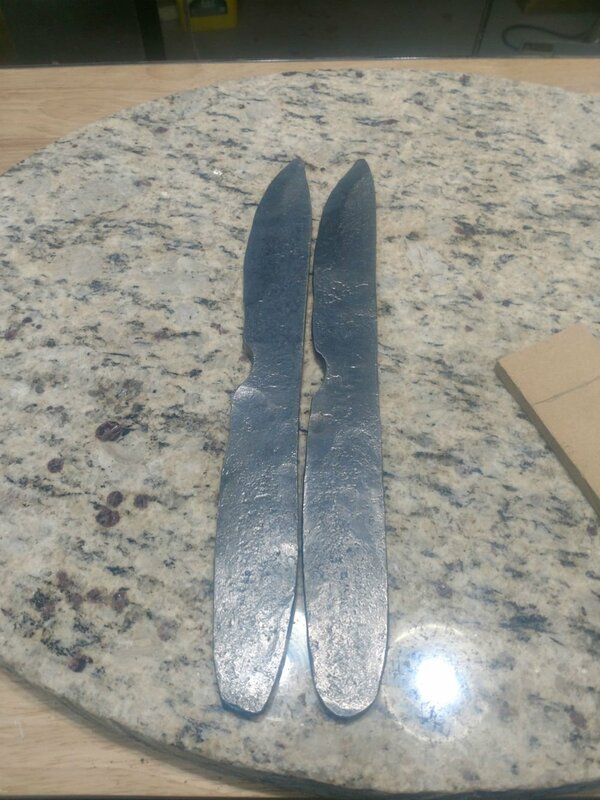 Finally, the two forged knives. Cool, you are unpurposedly doing Rossi's double knife challenge . They look very similar so far! 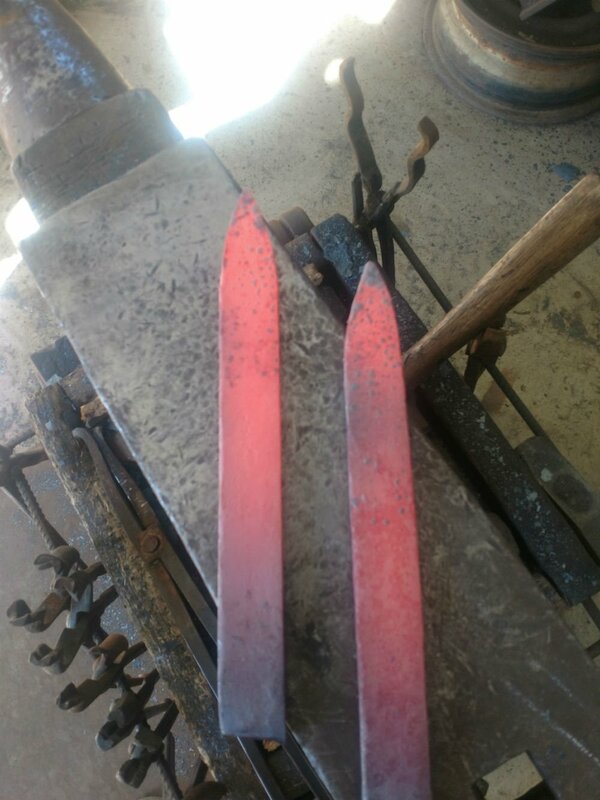 Then I forged two more knives and rough ground them out. After HT, they looked pretty good. Hardness was right between 60/62 HRC. On to surface grinding and polishing the flats when horror of horrors, I found that one of them had cracked at the spine. So, it's back to the forged out drill rod and time to make another blade. I rushed through this sequence and didn't take any photos, but yesterday I put it through HT and what did I find this morning? I've been doing this since 2006 and these are the first two knives I have lost in the quench. I've broken plenty on purpose and a couple by accident, but never before in the quench. That unfortunate Joshua, though seems odd that it would happen twice. What did you quench with? Maybe its worn out? 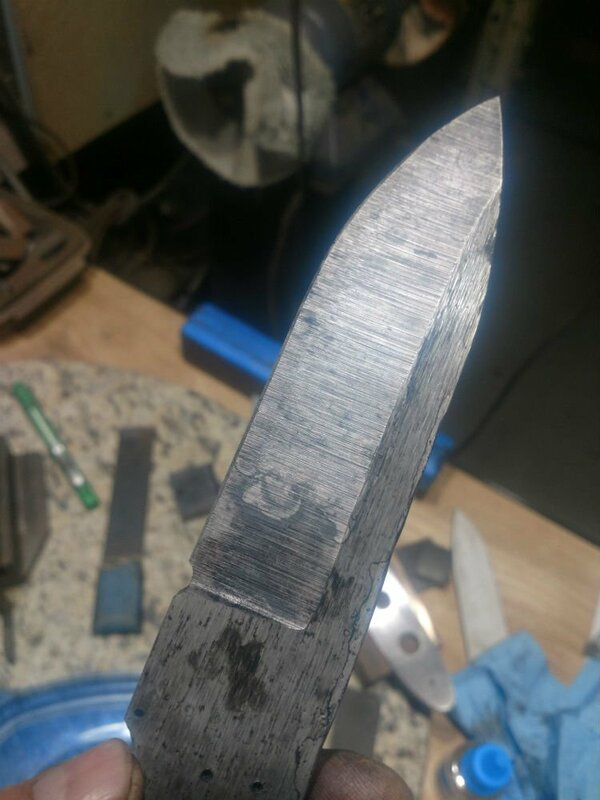 When I stared making Damascus, I used the 1080/84 and 15N20. Mostly because I could get them both in 1 inch strips. Any other widths didn't match and I had to find a way to cut them down to the same width. Since then, steel selection and availability has grown exponentially and I have moved to using 1095 for the darker etching capability and 15N20. I have a plasma cutter so I can buy the 1-1/2" wide by 1/8" 1095 and sheets of .06" 15N20 that are 8" wide and 72" long. I just cut the 15N20 to match. Ray Rybar once told me that when you find something that works, buy enough of it to last your lifetime!. I am using a Texaco fast oil that I purchased 5 gallons of a long time ago. I don't really think it "goes bad" over time. I would consider the possibility, but I have quenched a half-dozen knives in the last week, two others at the same time as each of the two that cracked, and not had a problem. I started to think it might be related to the cross section. The two that cracked are hollow ground. 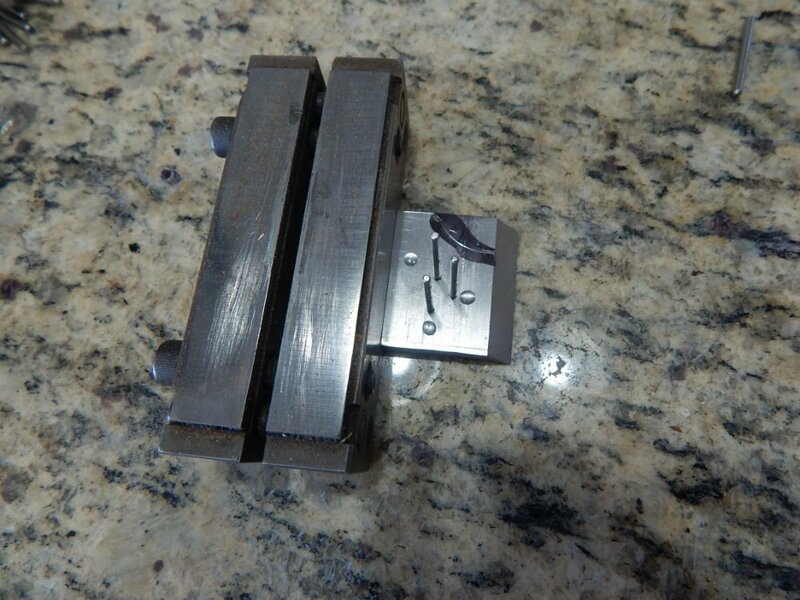 But the knife on the right side in the picture below is also hollow ground and has a much thinner edge. The cross section of this knife is far more drastic a change in a shorter distance than the two that cracked. Besides, one cracked at the thickest part of the blade, the other at the thinnest. So, I really am at a loss here. Interesting tang design. You decided to go with a full tang I guess. Yep. That will be a full tang with bolsters. I am using a Texaco fast oil that I purchased 5 gallons of a long time ago. I don't really think it "goes bad" over time. I would consider the possibility, but I have quenched a half-dozen knives in the last week, two others at the same time as each of the two that cracked, and not had a problem. I started to think it might be related to the cross section. The two that cracked are hollow ground. 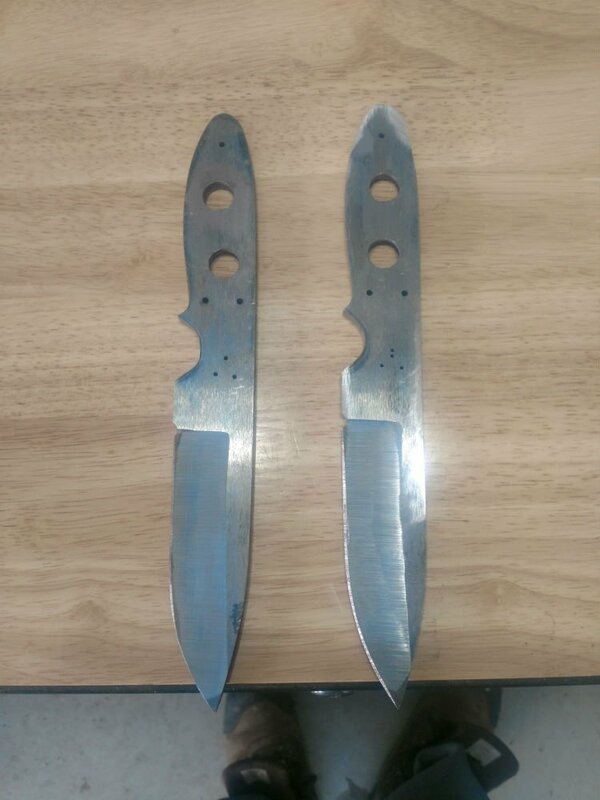 But the knife on the right side in the picture below is also hollow ground and has a much thinner edge. The cross section of this knife is far more drastic a change in a shorter distance than the two that cracked. Besides, one cracked at the thickest part of the blade, the other at the thinnest. So, I really am at a loss here. I think you found it. The mix between radical cross-sectional changes and "fast" oil. Unless it's the weather. Or poltergeists. Maybe try one in a medium oil? Possibly the fast oil is pushing the O-1 just a tiny bit harder than it likes to be pushed? Bummer, whatever the reason. Good questions. 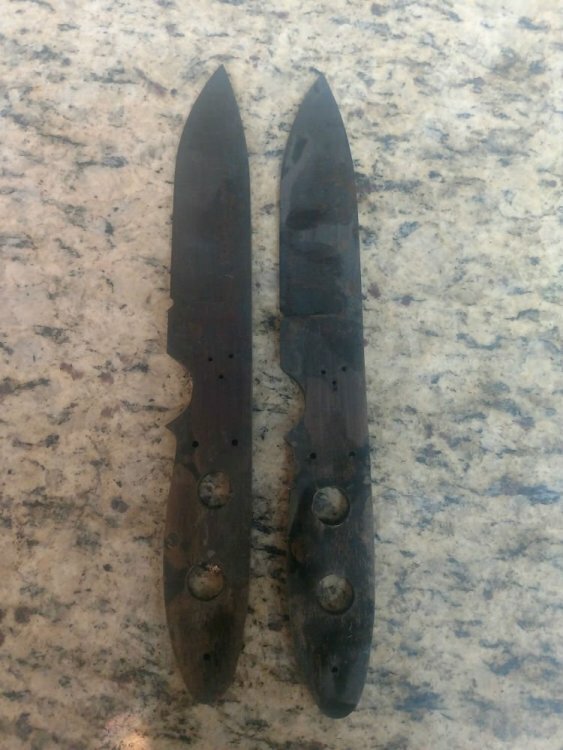 The two blades made from the flat bar never made it to the quench. The second two blades were made from the drill rod. One survived, the other didn't. The second replacement, that also cracked, was from the same rod as the first pair of replacements. Maybe try one in a medium oil? I have some of that out back. Like 40 gallons of it actually...…. Maybe it's time to try it out? However, I have been quenching O-1 in the Texaco stuff for years without a hitch. I think I'm leaning toward the poltergeist theory. Ive been edge quenching in shallow oil, some blades had 3/8" spines with dime thickness edges, I think its less stressful on the edge. The tricky part is rocking the blade up and down so the tip gets quenched, the blade likes to wiggle out of the tongs. Im assuming you use a heat treating oven so only heating the edge is out of the question. Edge quenching is one of those funny things. 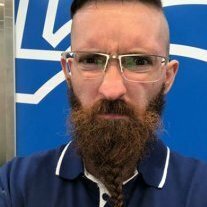 I don't really have a ton of experience with it, but I've read up a bunch of it from the ABS guys who coach folks through the JS performance test. It seems there is a divided camp on how to do it. Some folks, like Ed Caffrey, do the torch on the edge thing, quench the tip first and rock the edge down. Others have said to heat the whole blade and gripping the spine with the tongs, quench just the edge, rocking the tip to edge and back again until the blade is at black heat. Still others have recommended heat treating as normal and drawing back the spine with hot copper blocks on tong ends. However you do it, I never could see a reason to do it on a regular basis. A lot of this also depends on the type of steel used. My understanding is that O-1 is not agreeable to differential hardening, so I've never tried it. I was planning on trying it just as an experiment, and to see for myself. Maybe the "fact" of O-1 not being a good choice for edge quenching is just a myth that grew over time. I think we have a lot of that in the bladesmithing world. Someone long ago tried something and failed, and it was taken as "this will not work under any circumstances" and the thought remains. Just going off memory here... o-1 has many seconds to get from austinite to martensite to harden. So an edge quenched blades spine could air harden with assistance from the cooled edge. I edge quenched a 1080 chefs knife in canola and the whole blade hardened, oil was halfway the depth of the blade, blade is around 1.25" tall and just a hair thicker than 1/16". It took a good warp but I grabbed some pliers and got it mostly straight, if it had a soft spine it wouldnt have been a problem. I think I get less warps with edge quenching and you can straighten blades cold which is nice. I like the edge quench because you can straighten blades easily, I havent had anything break, and you get a neat little hardening line. 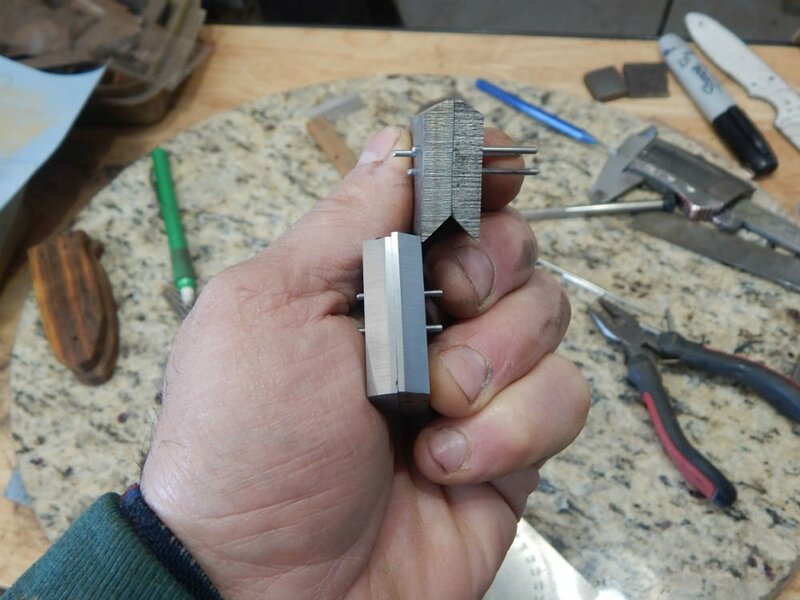 But you need enough hard edge to resist bending and taking a set too easily, I hardly lose any blades from quenching anyways, and I seem to get alloy banding in my hardening lines which looks interesting but may not be ideal for 180 degree bends. I think only heating the edge would be best, or maybe a hot malleable spine takes care of some quench stresses. You do have to leave the edge in the oil for a while while the spine cools so the edge will be the same temperature as the oil, but you could also use some heat from the spine for a quick temper or austempering (I think). If you do try edge quenching O-1 keep the oil shallow. Sometimes you get the bear, but sometimes the bear takes a dump in your living room first. Quench oil does have a life expectancy. However, I can't tell you how likely it is that you would have worn yours out. It could be that it will last forever for the average knife maker. Hopefully this is just a flock of flukes that came home to rest, but if you see this more and more, it might be time to change the oil. They say that 3 is the charm. Thanks to Alan for reminding me that I had 40 gallons of fresh medium speed oil out back. 64 HRC hardness chisel skated across the edge. That is an attractive knife and certainly looks friendly in the hand. I love functional designs like that; they speak for themselves. Form indeed does follow function. Thanks Wes. Now that I have the template, I can make more of these. So here's some progress and another screw up, although this one was procedural. After supergluing the bolster to the knife and drilling the pin holes, I cut the dovetails. 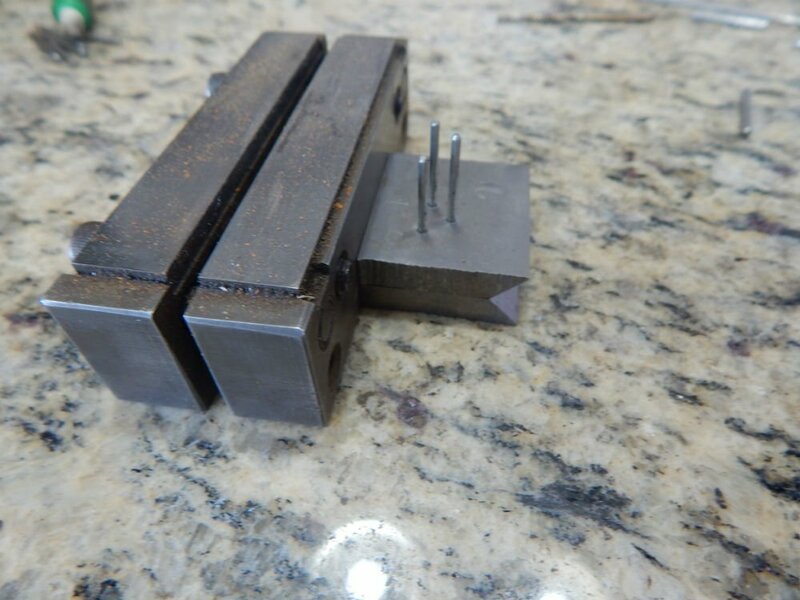 Both of these operations require that the front of the bolsters be polished to about 400 grit, dead flat and the back of the bolsters be parallel to the fronts. You then flatten the inside faces of the bolters to about 200 grit clap the file jig to the blade and superglue the bolster to the knife against the jig to drill the holes. Then you take the bolsters and put the outside faces against each other and superglue them together to grind the dovetails. Take them apart and you should have This when pinned to the blade. Now I plan to taper the tangs, so Ill need to be careful about matching the dovetails on the scales and applying the taper to the scales as well. The geometry is complicated by the complex miter joint. This is where I screwed up the procedure. I fit the dovetailed scale against the bolster and drilled the scale holes before tapering the tang or the scales. Bad idea. 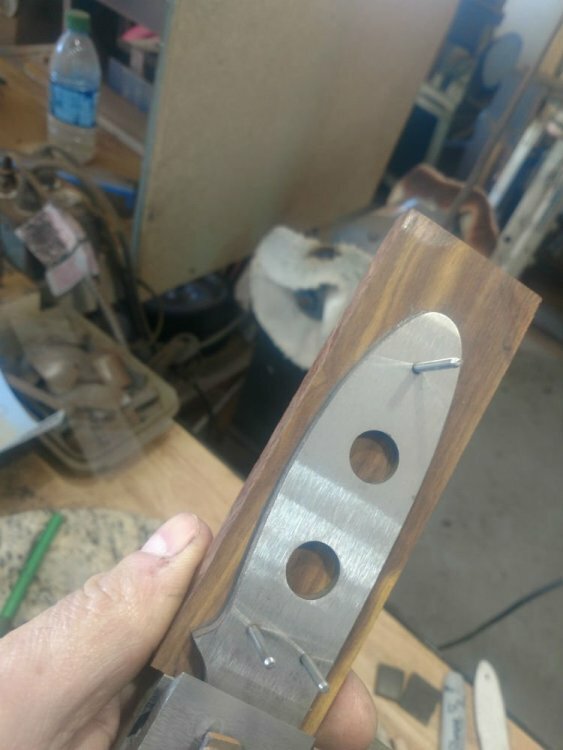 You have to taper the tang and scales before drilling the scale pin holes or the scales will separate from the bolsters. And then you clamp it all up and drill the slab holes. If you got everything right, it looks like this. And this is what $30 worth of ironwood kindling looks like. I feel sure you can use that ironwood on something else. I have a large pile of offcuts that come in handy for non-handle stuff. Or smaller handle stuff. And that's a nice dovetail/tapered tang! Thanks Alan. Every once in a while I do something right! A small amount of progress today. 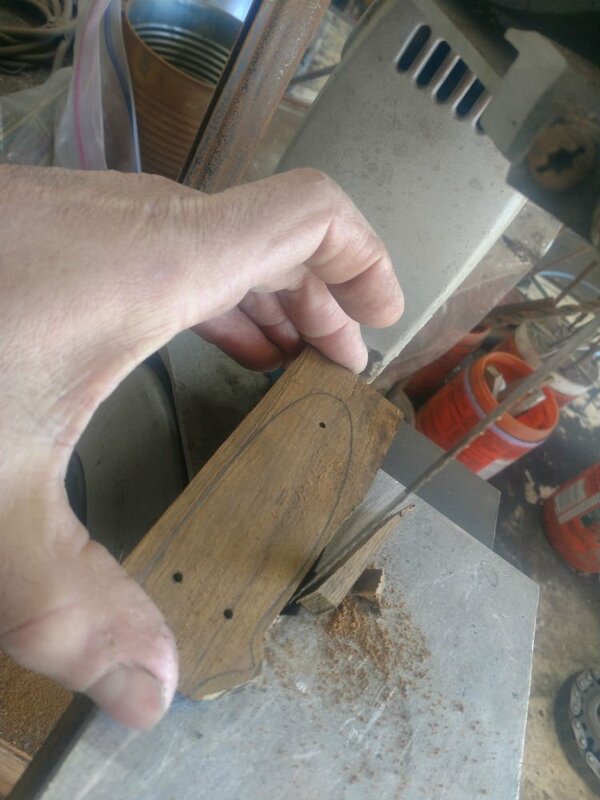 After pinning the scales to the tang, I scribe a pencil line around the perimeter and cut the excess off on the bandsaw. These bolsters will have a beveled front edge. I didn't show the whole superglue and grind process for the dovetails, but it is basically the same as this series of operations. With the front edges ground and polished to 600 grit place one of them on a flat surface up against at straight face. Install the pins and put 3 drops of superglue on the inside face. DO NOT get the superglue where it will glue the pin in place! Slide the other bolster over the pins and press together up against the straight face. I have an adjustable tilt work rest that I made for my KMG. 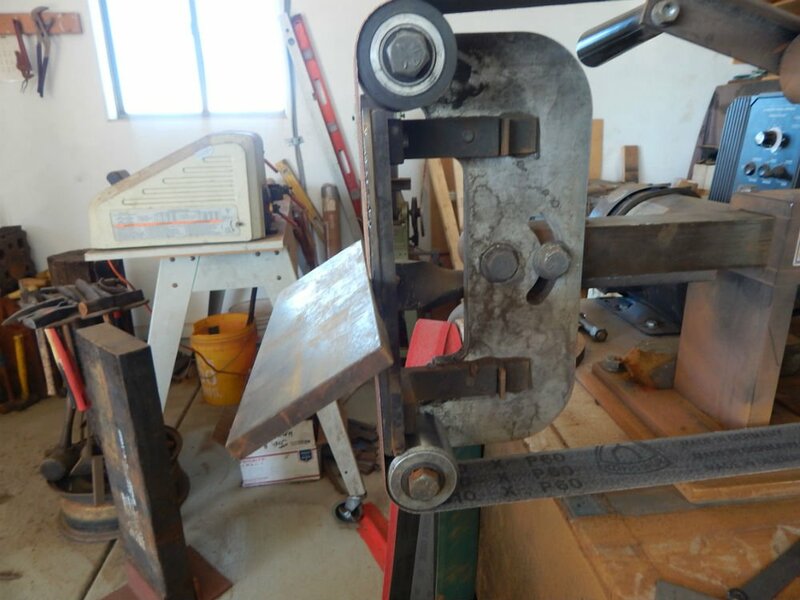 If you have a similar platen arrangement as this one, you can just tip the platen backwards and achieve the same result. I prefer the tilting rest because I can look at the grind face easier (at least it seems to be that way). Lay the bolster package on the rest and grind the bevel into the front face. Flip it over and do the other side. I do not grind the bevel all the way down to the bottom. I leave a little bit of flat there. This accomplishes 3 things: It leaves the front edge exactly where you positioned it to drill the pin holes. It allows you to see when the bevels are even. 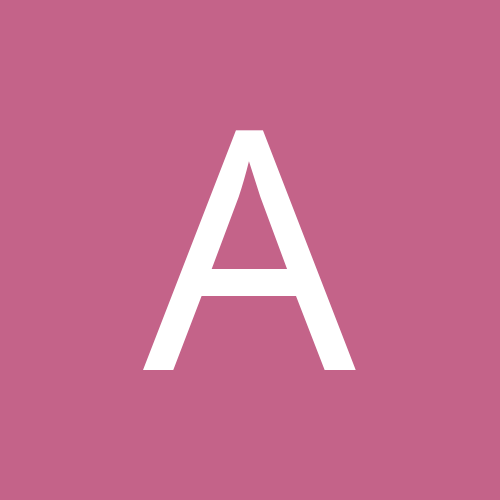 (the flat parts are the same thickness) and it adds another facet to the bolster. Facets are crow bait. They catch light and attract the eye. 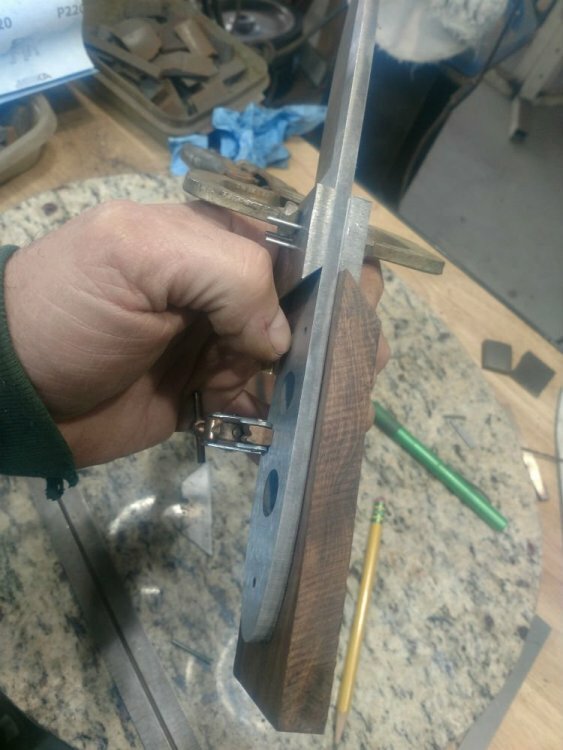 The bevels were mechanically ground to 400 grit (A45 Trizac) and are ready for buffing.